Sin-Jin Smyth takes place on Halloween in an America that has become a police state. On The Day of the Dead, two federal marshals report to a Shin Bone, Kansas jail to transfer a prisoner known as Sin-Jin Smyth during a tornado warning. 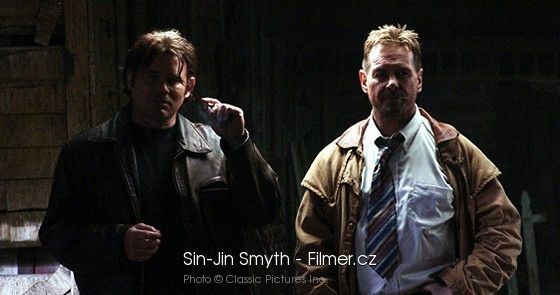 Sin-Jin Smyth follows these two corrupt federal marshals played by Roddy Piper and Richard Tyson as they “transport a prisoner with no past and no identity.” What they don’t know is that the prisoner is the Devil himself. Although I was only able to see a rough-cut of the film, I was immediately intrigued by its thick gloomy atmosphere and well-crafted cinematography. Even with scenes missing, I felt a great chemistry between the two federal marshals Roddy Piper and Richard Tyson. Great production value, high impact action sequences and the Devil played by Jonathon Davis…How could you go wrong!? Sin-Jin Smyth just might be the action packed hellride of the year! So, when will Sin-Jin Smyth be released? The films original release date was late 2006, pushed to a 2009 release date that never came to fruition. The film’s star Roddy Piper has since passed away at age 61 on July 31, 2015. It is unconfirmed whether principle photography was complete.